This series has been focused on introducing you to the concept of Stewardship. Stewardship takes on many forms; time, family, faith, talent, prayer and treasure. In the previous post, I described stewardship as it relates to family. 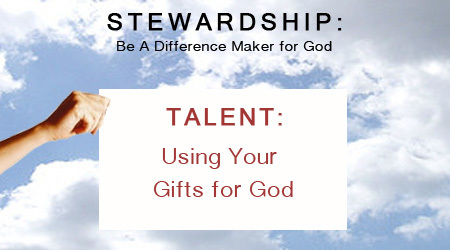 In this post, I will examine the concept of Stewardship as it relates to talent. All of us are blessed with talents. These talents are what make each one of us unique, different from one another. It continues to amaze me as I grow older the stark uniqueness and individuality of all of us, regardless of our similarities in where and how we grew up, where we were educated or where we worship or work. We clearly are so different from one another! I believe that our Talents are created by God and are so special that they were determined before we were even put on this earth. Because of this, I think it is important that if we were all created uniquely for a special purpose, that we respect and understand our unique Talents and differences. Having worked in HR for over twenty years and having witnessed some of the most unimaginable demonstrations of lack of leadership, I believe the most damaging are those leaders who fail to appreciate the Talent differences among the people who work for them and the organizations they lead. God created artistic people and God created analytical people. Without the stark difference of the Talents offered by each, we would still be living in primitive conditions. We must recognize the Talents of others and make an effort to lift all Talents up, and not just some. The most damaging act a leader can commit is one of diminishing one’s Talents not only directly to the person but to the person’s co-workers. Several years ago there was a highly talented, big-thinking, out of the box, strategic manager who was leading the accounting department for a company I served. This guy would have never been able to get the company to where it was without the Talents he was given by God. His lack of resources, people, and finances were made up for by his sheer devotion and imagination as to how to get more done with less, and make it work. Unfortunately, he fell victim to a new boss. This new boss came into the organization accustomed to having large amounts of staff, resources, and finances. He quickly dismissed anything the big thinker was doing, often ridiculing him in front of others and embarrassing him ruthlessly for weeks. Ultimately, the accounting executive was pushed to the side. To this day, I don’t think the new leader has any concept of what his lack of appreciation for Talent had done to the organization. That organization had potential, but now it barely gets by and people hate working there. How do I know? The employees keep calling me asking for help to get out! My challenge to you, therefore, is to think deeply and consult with your loved ones on discovering what your Talents are. What Talents make you unique? Most important, how will you use these Talents within your family, your church, and your community? My next challenge is for you to uncover what Talents your coworkers have. What makes them unique? How do they like to spend their time when they are not working? As we continue to grow and prosper as the body of Christ, let us do so by understanding others and ourselves at a greater level, so we can rise above our differences and continue to build the Church for a better tomorrow.